Made to Billy Joela��s We Didna��t Start The Fire, We Are South of India sets the record straight. Clarifying it is not a singular place and not all people from below Vindhyas are Madrasis, the video is made by Stray Factory (Enna Da Rascalas) and Culture Machine. The post tells off those who club together the states and their unique culture, and also enlightens those still in the dark. Four different contributors represent the four states (note: Telangana is left out) in the catchy tune worth a watch. The geeky, space loving girls at YouTube channel CREATURE are not pleased with JJ Abramsa�� reboot of Star Trek. The ladies decide to parody Meghan Trainora��s latest hit All About That Bass, change it to All About That Space and hit out at the director with clear worries of the next film he is making a�� Star Wars VII. Watch as the ladies dress up as sci-fi characters like Darth Vader, Spock and the biggest blow a�� Peter Quill aka Star-Lord from enemy camp Guardians of The Galaxy. 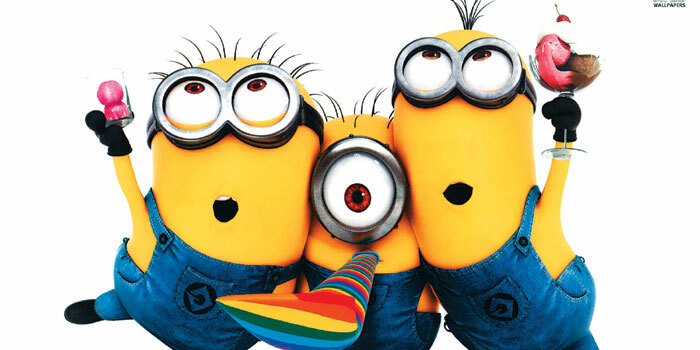 Meet Stuart, Kevin and Bob, the first of the Minions, as they set off to find the ideal master a�� the most despicable one. Tracing the history of the yellowA�and hilarious henchmen, the film will follow their time on Earth and how they always look for trouble unwittingly. But their masters, including dinosaurs, seem to always become extinct, until now. The trailer is a great preview to a cuteness overdose come July 2015. It has already garnered 11 million hits!